Rush Limbaugh, who is white, guaranteed a few days ago that we would become more and more impressed with Richard Sherman, who is black, as we learned more about him. 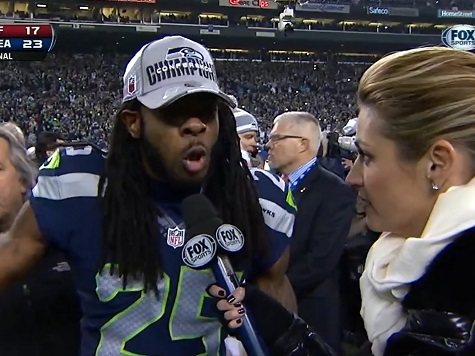 And Rush was right, as Sherman continued to eloquently put his over the top post game rant to Fox Sports into perspective, including what appeared to be a sincere apology and reasoned explanation. That is, until he had to go and play the first resort of the intellectually bankrupt–the worn-out race card. And apparently not satisfied to allow MSNBC’s anchors the exclusive rights to detect racist dog whistles all across the country, ESPN’s Scott Van Pelt has joined Sherman with the Chris Matthews-esque ability to hear racist dog whistles in, well, just about anything. To reiterate and enhance what Mark Steyn said about this phenomenon while hosting Limbaugh’s show a few weeks back, it is actually those who hear the racist dog whistle who by definition are the racist dogs. It’s not those of us who are accused of blowing it who are the racists. We don’t hear it, because the racism doesn’t exist. Indeed, that is only logical. So what is this latest dog whistle term according to Sherman and Van Pelt? “Thug.” Yep. Never mind that many people think ultra-white Richard Trumka when they say thug. Or they envision white Teamsters beating up Tea Partiers, including black Tea Partiers, in 2009 and 2010 viral videos. Sherman tells us it’s a racist term, and Van Pelt agrees. Dog whistle indeed. I hate to break it to you Mr. Van Pelt, but Sherman is not right, and neither are you. Thug’s historical roots have nothing to do with the African American race, nor would I submit does its contemporary usage. It’s most often used among those racist Tea Partiers – the ones Jeremiah Wright said were a lynch mob 2.0 – in reference to white union leaders. These were surely the racists who Sherman and Van Pelt were referring to. For crying out loud Scott, you don’t even need a dog whistle to hear the racism in that little ditty.